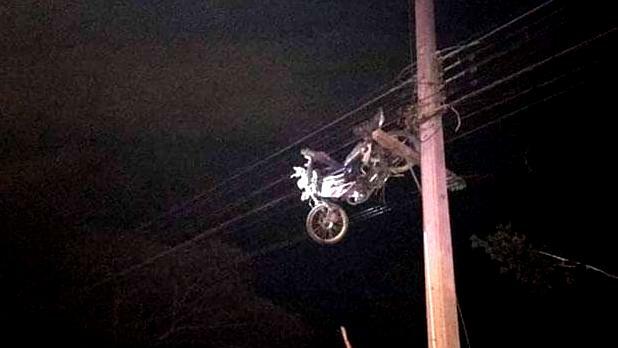 SURIN: A crash injured several people and left a motorcycle hanging from power lines about 10 metres above the ground in Kap Choeng district late on Sunday night (Mar 10). A motorcycle that was loaded on the bed of a pickup truck is seen suspended from power lines after an accident in Kab Choeng district of Surin province late on Sunday night (Mar 10). Photo: CB650F Thailand Facebook page. Rescue workers inspect the wrecked pickup truck after the accident. Photo: CB650F Thailand Facebook page. The impact sent the Honda motorcycle flying through the air. It ended up suspended from high-voltage power lines above a local road in the northeastern province after the accident. Eyewitnesses said the bike was being carried in the bed of a silver Isuzu pickup truck. The truck swerved to avoid a motorcyclist riding against the traffic, they said. The pickup overturned and came to rest upside down, its cab crushed, while the motorcycle on its bed soared upwards and was caught on the power cables. 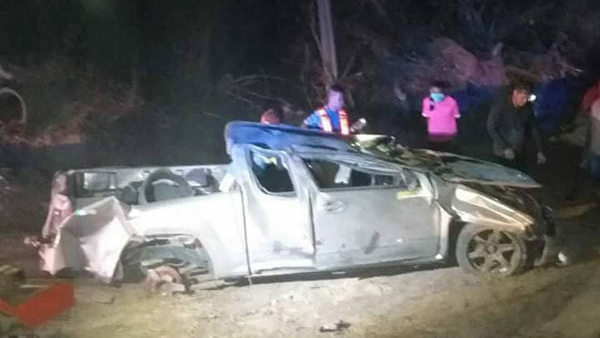 Five people in the pickup truck, registered in Surin, were injured and were sent to Kabchoeng Hospital. Four of them were identified as Chatchai Wongcharoen, Peerapat Wongcharoen, Surasak Soodtong and Detnarong Phumlee. Hahaha, one must see the photo to believe it. But now serious, the RTP decision ( contradictory thai laws) to allow people to sit unsafe in pick up beds during Songkran, when roads already lesser safe, means there is a chance to see, instead a motorbike, people hanging in power lines after road accidents.